Over time, toxins and other chemicals that cannot be eliminated as waste build up in your body. Dandelion root is a natural diuretic that may help remove water-soluble toxins from your body. When combined with weight loss, a healthy high fiber diet and exercise, dandelion root can help improve your overall health. Dandelion root has not been shown to be effective in treating or preventing any medical conditions. Talk to a doctor before taking dandelion root. Dandelion, Taraxacum officinale, is commonly considered a pesky weed, but it is also eaten and used in herbal medicine. According to the University of Maryland Medical Center, dandelions are high in A, B, C and D vitamins as well as potassium, zinc and iron. 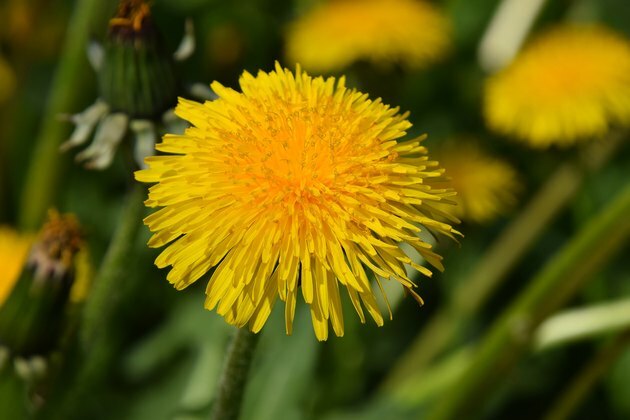 Medical traditions, including the Native Americans, used dandelions to treat liver disorders, commonly associated with the buildup of toxins and waste in the body. Dandelions act as a potent but natural diuretic. A diuretic is a chemical that stimulates your body to produce urine, eliminating water, minerals and waste. Diuretics are only beneficial when used for a short time. Elimination of body water and water-soluble waste is rapid and the maximum effect is reached in only a few days. However, long-term use can cause dehydration, and as a result, lead to water retention and high stress hormone levels. In general, toxins are chemicals that can cause harm to your body. They can be eaten in food or produced normally by your body or by pathogens such as bacteria, fungi and viruses. According to the Merck Manual, metabolized drugs and other chemicals can either be eliminated through urine or solid waste. If toxins are unable to be excreted rapidly enough, your body stores them in fat or excess water to mitigate damage. Diuretics such as dandelion root may help remove water-soluble toxins and eliminate excess body water, at the risk of dehydration. However, much of the concerning toxins in your body, such as pesticides, will not be appreciably removed by diuretics. According to the National Institutes of Health, no research exists to evaluate the effectiveness of dandelion root for any use. Diuretics carry the risk of severe dehydration. Do not use dandelion root before bed as it greatly raises the risk of severe dehydration. Some people may be allergic to dandelion. Do not take dandelion with or diuretics or water pills to avoid dehydration or high potassium levels. Dandelion root may change how your body processes and eliminates other medications, potentially causing them to increase or decrease in their effectiveness. Are There Side Effects to Using Senna Laxatives? What Are the Health Benefits of Burdock Root Tea?